Commercial - Volpe Enterprises, Inc.
Volpe Enterprises provides roof installation, repair and maintenance services for commercial structures, including condominiums, office buildings, malls, retail stores, shopping centers, churches, schools, municipal buildings, warehouses and restaurants. 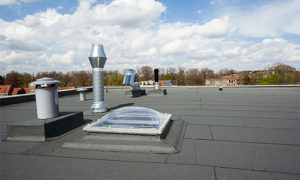 Flat – Flat roofs are the most common type of roofing found on commercial buildings. Addressing the roofing needs of a flat roof is a highly specialized area, as drainage and coverage issues must be properly addressed. Volpe Enterprises can install single ply membrane roofs or built-up roofs on a flat or low slope surface, as well as provide services for all types of flat roofs. Asphalt Shingle – For peaked roofs, asphalt or fiberglass shingles offer affordable protection in a wide range of styles and colors. Let us help match the right shingle choice to your commercial building’s style, size and décor. Slate – One of history’s oldest roofing materials, modern slate roof panels are modified to be lighter and more affordable, while still delivering the elegant look and long life of a slate roof. Slate is especially appropriate for historical buildings. 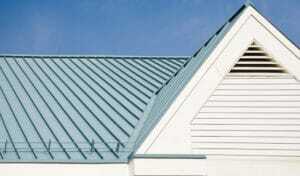 Metal – Metal roofing is fast becoming a preferred material across the country. New alloys and coatings make metal roofing panels more durable, with extended lifecycles that can exceed shingles or shakes. Plus metal roofs can be architecturally dramatic and colorful.